These handmade hot sauces achieve unforgettable flavors by including unexpected fruits and vegetables. Broja is a traditional tomato-based hot sauce with a twist: a flavorful infusion of carrot. Purple Blaze goes completely wild with the addition of blueberries, creating a sweet, rich hot sauce that will make stir fry or grilled vegetables unforgettable. Habacado packs the classic flavor of avocado right into the hot sauce bottle. Strabeñero adds sweet, tangy strawberries into the heat, creating a flavor that works great for grilling, and can even be used as a marinade. Handmade in Indian Hills, Colorado. Clay Meers knew his future wife Tami was "the one" when, one day at lunch, she pulled a bottle of hot sauce out of her bag. Shortly after, the couple moved to Steamboat Springs, Colorado, where they turned their combined love for hot sauce into a full-fledged business that has surely inspired many a spicy courtship since. Habanero hot sauce flavors include: Broja (carrots and tomato), Purple Blaze (blueberry), Habacado (avocado), Strabenero (strawberry). 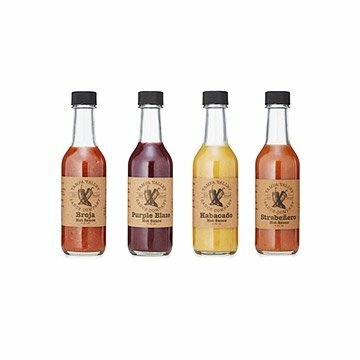 We love these hot sauces and have used them (all of them) on potatoes, rice, rice & beans, tacos, enchilada's, eggs, chips/nachos, and soups. We like them so much we sent a set to my sister. They come packaged really nicely, so they do make a nice gift. Get yourself some! This is a gift and he loved it! This set is perfect for a quick and easy Fathers Day or Birthday gift as it is unique and nicely packaged. Definitely not like something you could pick up at a big box store. Definitely going to keep buying these! I bought this for my boyfriend who loves hot sauces. These sauces exceeded both of our expectations. Each flavor is so delicious! We will be buying these every time we run out. I have purchased these twice now! This was a great gift and arrived way sooner than expected which was great! Bought these for my husband although I use them myself just as much! Each flavor is great. They're not too overwhelmingly hot. Just great flavor with enough heat to give whatever it's on an extra boost of delicious. Nice packaging. A gift. The fact that they donate to a cause is another get reason to buy from them! I use this on just about everything. From Mexican dishes to breakfast, it works great on everything. I haven't tried it on cereal yet, but I bet it would be darn good on that too. From the bold colors and flavors to the cute and convenient packaging, this is where it's at for any gift you want to give. These hot sauces are the best I've had! All unique and so good! They go with everything! I got this gift for a friend who has every kind of hot sauce imaginable and these are now his new faves! OMG, best hot sauce ever!!! OMG best hot sauce ever!!! I am a hot sauce fiend and none of these disappointed. My taste buds were dancing. They are all so unique and one of a kind. They pair with different foods amazing and I have thoroughly enjoyed them. I like the for myself, I have gifted them to others. Everyone raves about them. YUMMY!!!!!!!!! !